Alex Meixner presents a variety of music throughout this CD album! “Three Ring Circus” features one of the hardest working men in polka music. Alex Meixner is well known for his musical abilities. 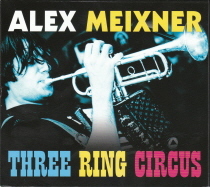 Check out this CD with Alex Meixner! Special Guests include: Ed Klancnik, Brian O’Boyle, John Conahan, and more!